Back to the Adirondacks we head. 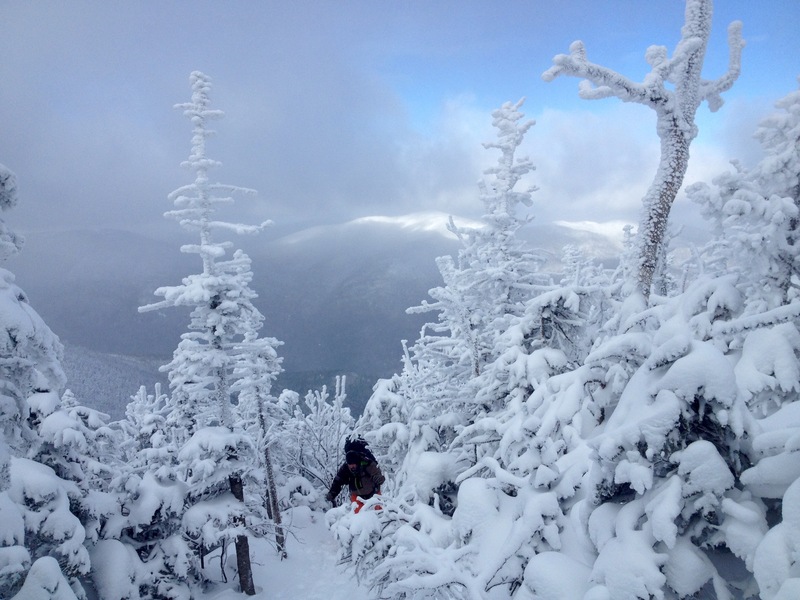 This time knowing full winter conditions exist as we attempt Wright Peak, Algonquin and Iroquois. We planned to hike into a primitive campsite near MacIntyre Falls and short of Wright Peak, 2.6 miles from the trailhead. Temperatures were in the low teens as we changed into our trail clothes in the parking lot. We were on the trail shortly after 4:30pm, snowshoes were kept on our packs as this first section of trail was well packed down. Hiking was smooth and steady to the Algonquin/Marcy Dam junction. Here our trail split to the north and quickly steepened as we ascended 1600 feet in the 2.6 mile trip. It became full dark during this time and headlamps were worn as we double checked our maps at various foot and ski trail junctions. Upon arrival at our backcountry site, we first donned our down jackets to preserve warmth, the hike up had us down to only our thermal base layers. Next we went about setting up our 3-person Mountain Hardware tent. We slit up the weight between us; Joe carried the fly, Greg the body and myself with the poles/stakes. With setup complete, we were happy to get our sleeping pads inflated and sleeping bags set as we crawled into place. Next was dinner. 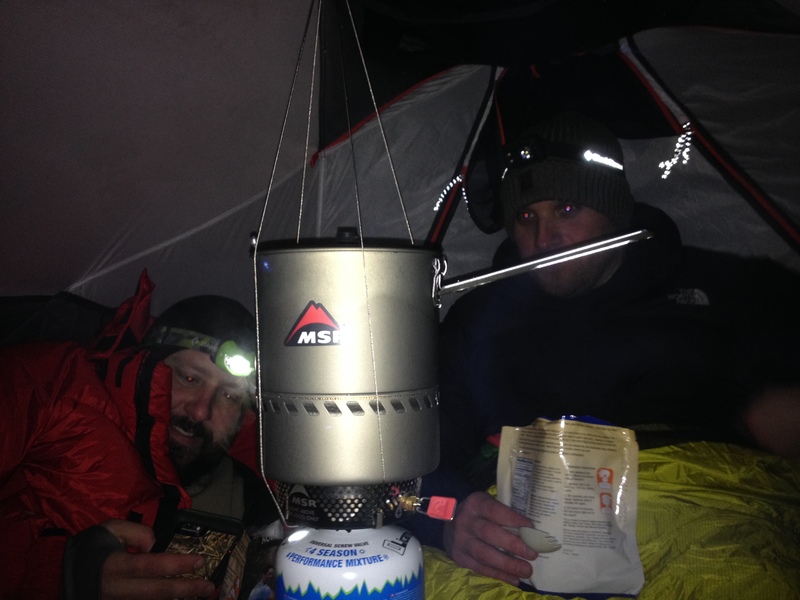 I had recently purchased an MSR Reactor hanging stove set for cooking inside the tent. This thing was amazing and all the top-end reviews were correct. 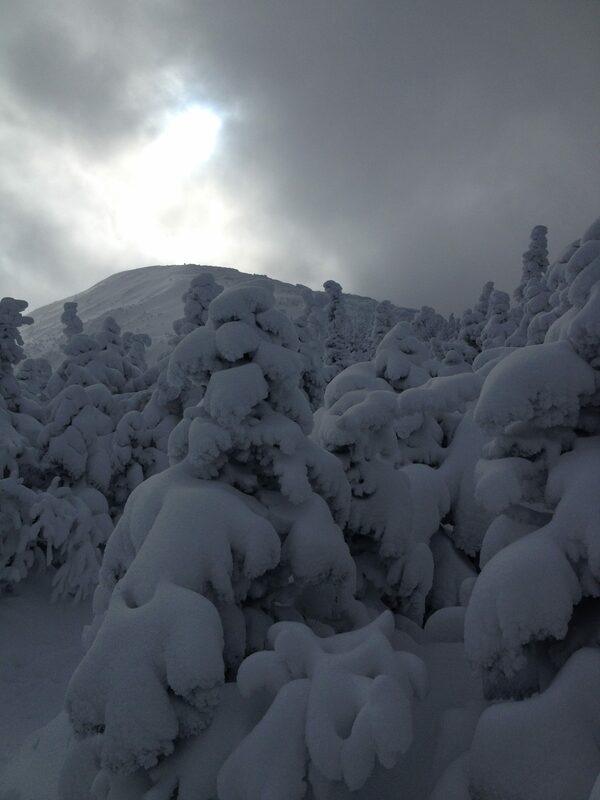 It melted all the snow for our Mountain House meals and water bottle refilling and only used less than half an 8oz. canister of Olicamp 4-season fuel. We were all thoroughly impressed. Not long after dinner we were asleep and snoring in preparation for tomorrows long day. I’ve never been so warm and comfortable sleeping in 0 degree temperatures, my Western Mountaineering bag was never zipped completely, another quality piece of equipment when teamed with the Thermarest Xtherm NeoAir pad. We all again slept with our boots and gloves to prevent them from freezing overnight. In the morning we packed up our entire campsite. 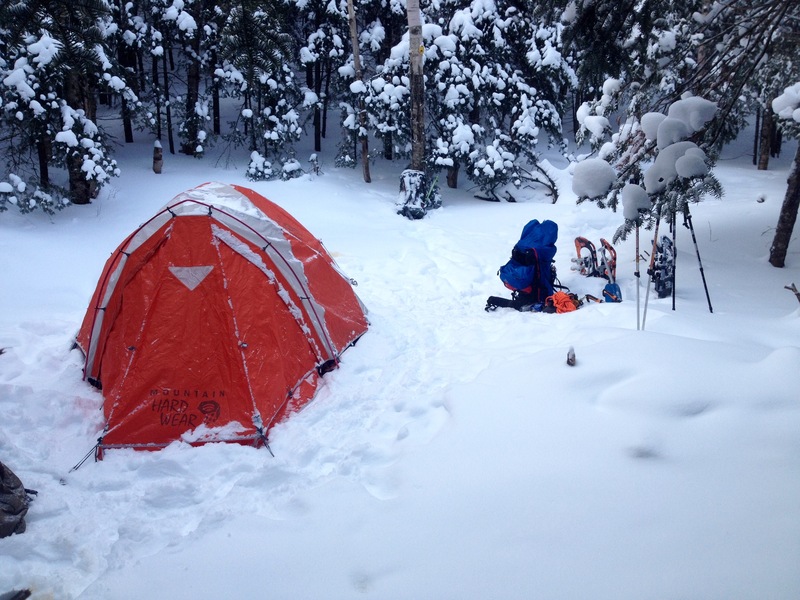 This gave us options with not exactly knowing our next camp location due to weather and terrain. 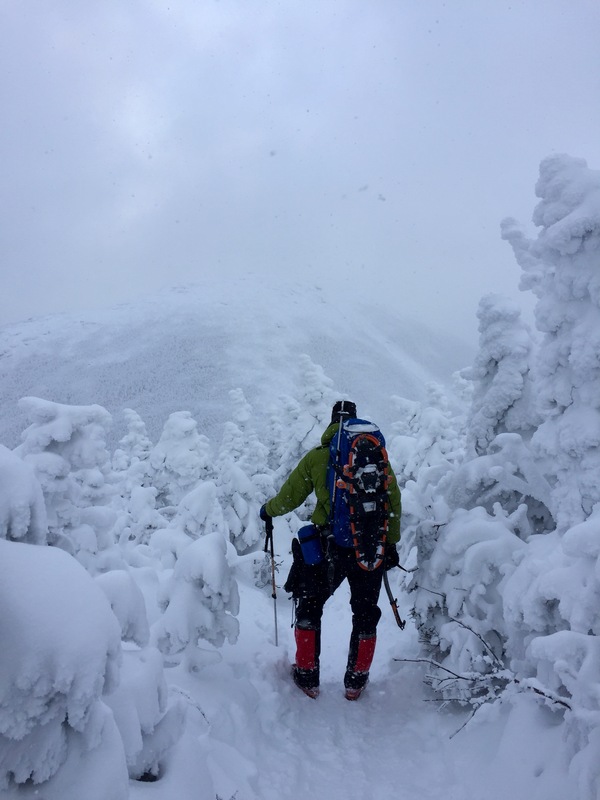 With everything packed and snowshoes on our feet we started down the trail toward the Wright Peak junction. We quickly met up with some day-hikers at an icy scramble section that required tree grabbing and some ice axe usage. Again the trail was rather steep and the additional unfamiliarity of snowshoes slowed our advance, but we eventually made it to the Wright Peak junction were we paused to eat a ClifBar before heading up. Up the Wright Peak trail we went as others stayed on the Algonquin Peak trail. The snow was noticeably deeper and required us to crawl under tree branches that would be walked under in the summer months. As we neared treeline, we stopped to put on our goggles in preparation of the 45mph winds in the exposed environment. After a couple hundred yards I made the decision to stop next to large rock and remove snowshoes in favor of microspikes for the remaining time to the summit. I also put on my down jacket and overmittens. We continued up until there was no more up to be gained and the other side of the mountain was in view. The sun would periodically shine through, but the full force of the wind kept us from lingering to long. We started our descent after 5-10 minutes of sightseeing. 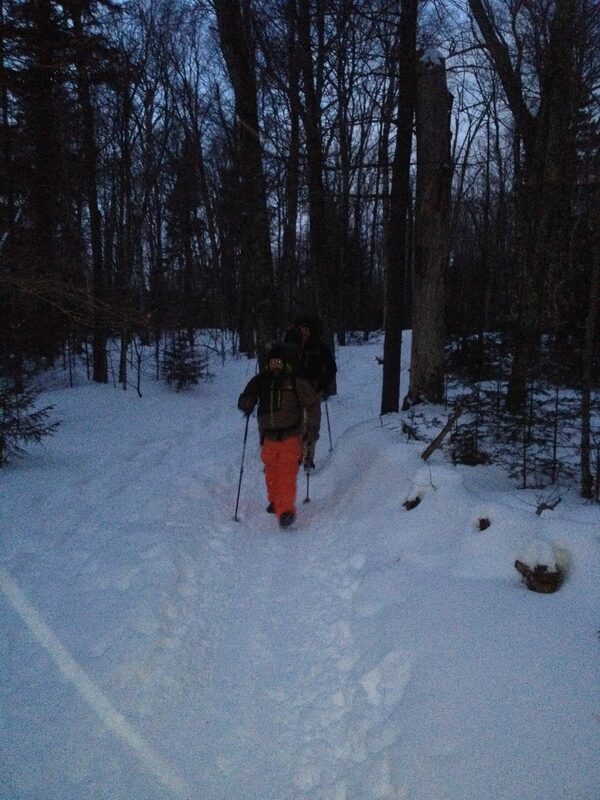 Back at the trail junction, we did a time check and made the decision that Algonquin would be our last peak this trip. To proceed on toward Iroquois would keep us out and exposed well past dark and even more fatigued, not a good combination. Up the Algonquin trail we went and soon started to pass fellow hikers on their way back down, some whom were successful and other who turned around not being comfortable with the conditions. The trail prior to the end of treeline was rather steep and most on their way back down were glissading and having fun with it, we would do the same. 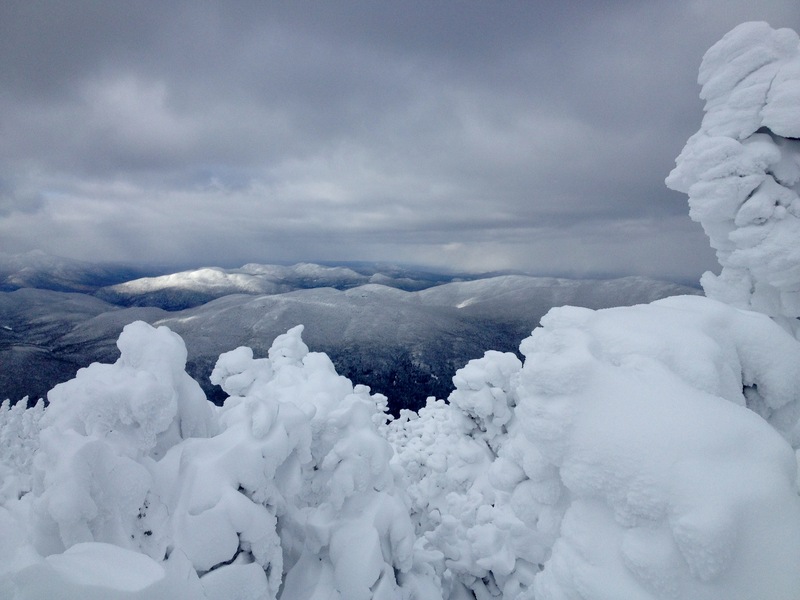 We stopped and put our down jackets and mittens back on before emerging from treeline for the last ¾ to a mile distance to the summit. The wind had blown smooth most of the remnants of previous groups tracks. This made navigating the most efficient path to the summit a bit more challenging. We also made sure not to separate ourselves by more than 20 yards at any time. During one strong gust of wind and snow, both Greg and I had trouble identifying each other. Additionally, I make a point of turning around and observing prominent landmarks to use while on the descent. In this case, our entrance back into the trees was approximately the midpoint of two distant peaks. Working together we eventually gained the last bit of altitude necessary and stood atop the second highest peak in New York, Algonquin (5,115ft.). As you can see in the photo, there is little difference between the snow covered ground and sky. Winds were blowing at the anticipated 45-50mph level and we did not stay long before starting our descent. The down climb went quickly and we held off conversation until we were back below treeline. Now the talk was about dinner and that we could easily make it back to the car before dark and possibly find a burger joint in town. With that agreed upon, we also removed our ice axes from our packs in anticipation of glissading certain sections of the trail down. 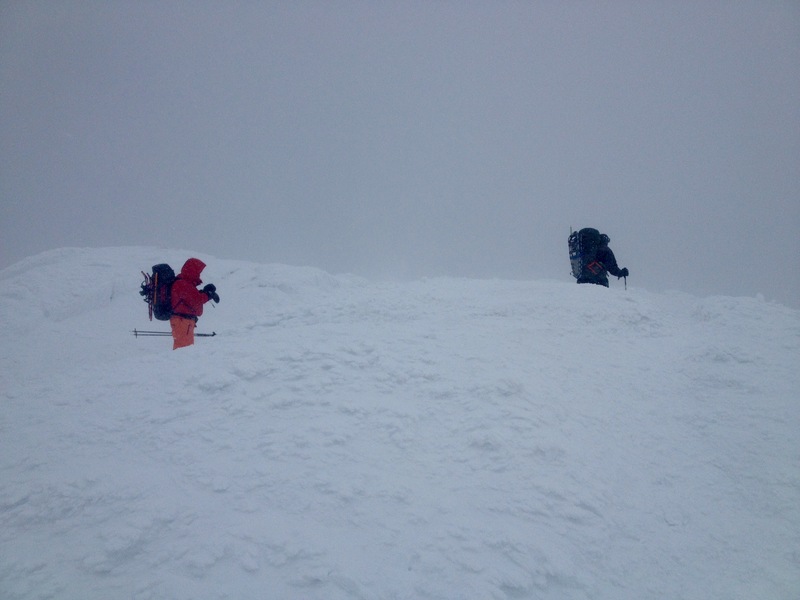 We gave Greg a quick intro to ice axe self arrest and started down. Most glissades were short, but one was longer and this was the first time I’ve had to truly perform a self-arrest because of how much speed I picked up and I didn’t wish to slam into a bunch of trees. Thankfully, it all worked out as designed, Joe and Greg were also successful in their glissading adventures. It wasn’t long before we passed the cut-off trail where we camped the night prior. Shortly after this point Joe noted that his back was starting to cramp from carrying his pack all day. We had been with packs and on our feet now for about 6 continuous hours. This drastically slowed our progress but the thought of burgers and fries kept us enthusiastic for the car and trailhead. 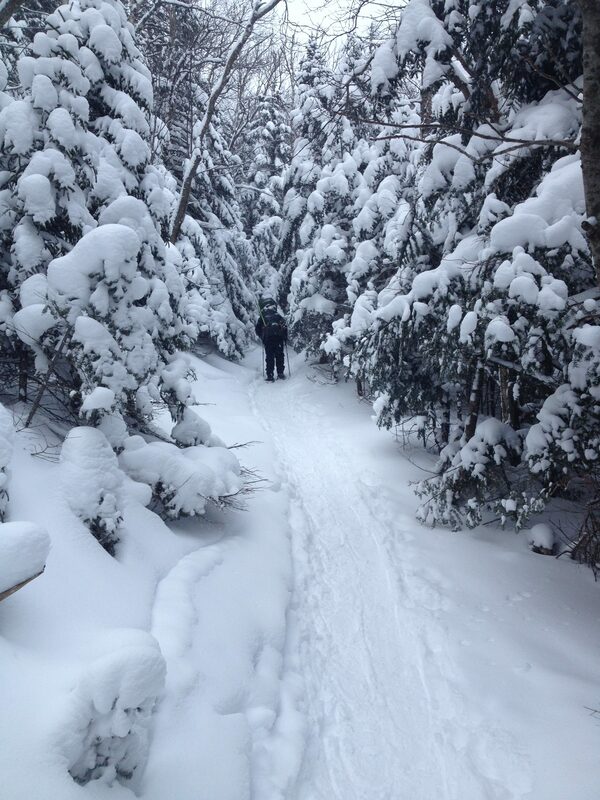 At the Marcy Dam trail junction we were met by numerous day-hikers all snowshoeing out as well. Some were local, while others came from Canada and the surrounding states. We traded the day’s stories with each other on this final leg. Back at the car, we shed our outer layers and drove towards town in search of eats. The first place we saw was the Big Slide Brewery, so we turned around and went in for food and drink. We planned to drive the 8+ hours back to Ohio through the night so only one beer each, but we ordered 2 meals apiece and extra water. The hills create quiet and appetite.